Baldy Mt Ski Resort, located on the edge of the Okanagan Valley, BC, is accessible from both Canada and the US. 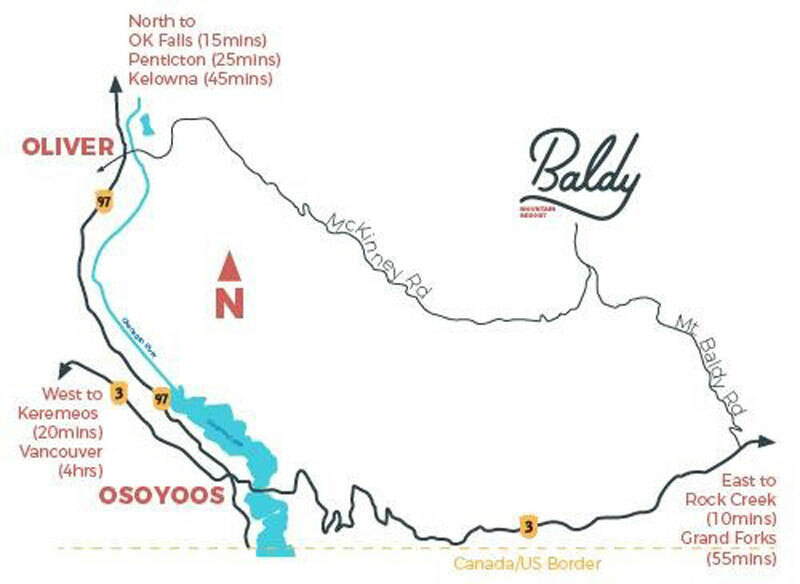 It is 35 minutes from Oliver and 45 minutes from Osoyoos, less than an hour from the US border, and roughly 5 hours from Vancouver. Known as a “locals” and “family friendly” resort, Baldy boasts 500 skiable acres, epic powder, and rarely has lift lines, meaning a visit is sure to bring a smile to any mountain lover’s face. From Oliver: Head northeast on Fairview Rd toward Station St and Continue onto Park Dr. Turn right onto McKinney Rd and follow until you come to a T junction after about 30 minutes, then turn left and continue straight to Baldy Ski Hill Rd/Mount Baldy Rd. There is signage for the ski resort along the route. From Osoyoos: Head east through town on Main St/Crowsnest Hwy/Hwy 3 East, and follow for about 38 km. Turn left onto Canyon Rd off of Hwy 3 (this is signposted). Follow Canyon Rd for 2 km and then turn left onto Baldy Ski Hill Rd/Mount Baldy Rd. Continue following Baldy Ski Hill Rd/Mount Baldy Rd to the resort. There is signage for the ski resort along the route. From Penticton: Follow Hwy 97/Okanagan Hwy/BC-97 S. Turn left onto Tucelnuit Dr. Turn left onto McKinney Rd. Turn left at the T junction onto Baldy Ski Hill Rd/Mount Baldy Rd and follow to the resort. From Vancouver: Baldy Mountain Resort is roughly a 5-hr drive. Take the Trans-Canada Hwy/BC-1 E towards Hope. Continue onto BC-3 E. Use the right 2 lanes to take exit 177 for BC-3 E/Crowsnest Highway toward Princeton/Penticton, continue on BC-3 E for 191 km. Turn left onto Keremeos Bypass Rd, and keep left to stay on Keremeos Bypass Rd. Turn left onto BC-3A E and follow for about 30 km. Turn right onto Hwy 97/Okanagan Hwy/BC-97 S. Turn right onto Hwy 97/Main St/Okanagan Hwy/BC-97 S (signs for Osoyoos). Continue to follow Hwy 97/Okanagan Hwy/BC-97 S. Turn left onto Tucelnuit Dr. Turn left onto McKinney Rd. Turn left at T junction onto Baldy Ski Hill Rd/Mount Baldy Rd and follow to the resort. From Seattle: Baldy Mountain Resort is roughly a 6-hr drive. Head East on I-90 follow for about 79 miles. Take exit 85 for WA-970 N toward Wenatchee. Turn left onto WA-10/WA-970. Turn right to stay on WA-10/WA-970 and continue to follow WA-970. Continue onto US-97 N and follow for about 35 miles. Merge onto US-2 E/US-97 N via the ramp to Wenatchee. Slight right onto the US-2 E/US-97 N ramp to Okanogan/Spokane. Continue onto US-2 E/US-97 N and use the left 2 lanes to turn left to stay on US-2 E/US-97 N. Continue straight onto US-97 N and follow for about 123 miles to the US/Canada border crossing. US-97 N turns slightly right and becomes BC-97 N. Turn right onto 89 St (signs for Osoyoos Town Center). Follow directions above from Osoyoos. The Mt Baldy access road is a partly paved and partly dirt road. Winter tires are HIGHLY recommended during winter months. The nearest airport to Baldy Mountain Resort is in Penticton. There are direct flights to the Penticton Regional Airport from Vancouver and Calgary. Check for flights from your area to Penticton. Upon arrival, rent a car and follow directions from Penticton to Baldy Mountain Resort. Penticton offers a selection of Car Rental services. The nearest international airport is Kelowna (YLW) and it offers car rental services. The drive from YLW is two hours and 15 minutes.